The tech landscape is changing. More and more applications are migrating to the cloud. It is getting harder and harder to sell software and hardware behind the firewall into an on-premise data center. Since 2012, RAE Internet Inc.has been working closely with its network of international and domestic resellers to give them a low-cost, feature-rich SaaS solution to email filtering. The Mailspect Defense offering is designed to compete with Google Postini and Microsoft offerings. Mailspect specializes in Linux-based solutions that deliver cost savings due to the usage of free Open Source components like Postfix, MySQL and Sphinx. Traditional VARs like Answer SRL in Italy are deploying more and more Mailspect Defense Standard and Mailspect Archive in the cloud for their customers who want to buy a service, instead of hardware and software. Mailspect Defense / Archive is a messaging processing platform that can manage the entire spectrum of email services from a single control panel. 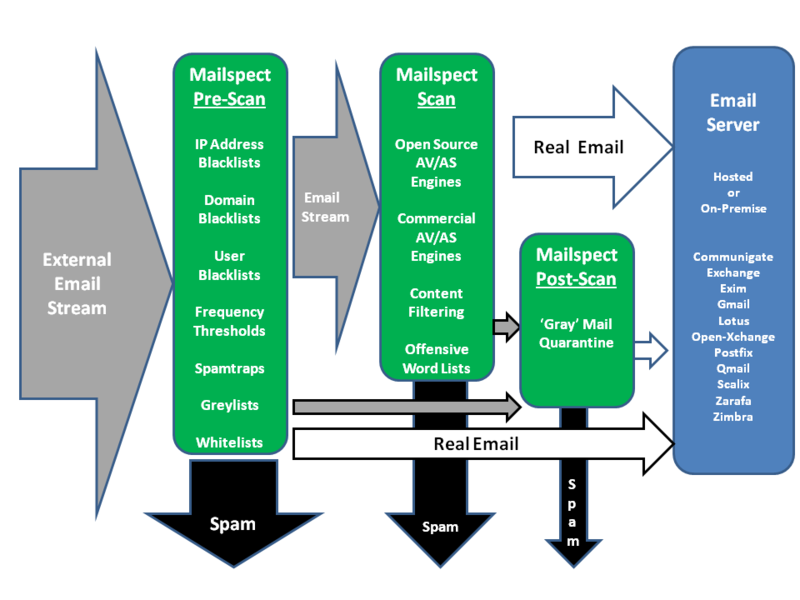 Mailspect manages and automatically updates one or more virus and/or spam scanning engines simultaneously. This is particularly important to service providers who are required by contract to use multiple scanning engines to increase accuracy. It also controls pre-queue services such as real-time black lists, SURBL, DNSBL, spam traps, alphabet attackers and denial of service attackers. On the backend, Mailspect has a user friendly quarantine module where end users can quickly resolve ambiguous emails. It includes global and personal signature tools, time stamping, email search and discovery, messaging routing and tracking, custom word filtering, extension filtering and data loss projection based on suffixes or key words. Mailspect supports Ubuntu, Debian and Red Hat. Mailspect offers very competitive pricing plans and payment terms. These commercial terms and conditions are designed to allow the ISP or web site hoster to be paid by the client before a royalty is due to Mailspect. This ‘pay as you grow’ program helps VAR’s to transition from a reseller to a SaaS provider with little or no upfront investment. For information contact Simone Duncan at sales ( a ) mailspect.com.